World Standard, Meets DOT FMVSS 218 (US), ECE 22-05 (EUROPE), SAI AS1698:2006 (AUSTRALIA) & PSC (JAPAN) Helmet Safety Standards. Does Not Ship With SAI, PSC Or MFJ Certification Stickers Unless Purchased From An Authorized Dealer In That Country. Below is a size chart provided by Icon for this product. 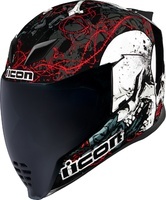 This breath guard fits Icon Airflite helmets. You can replace the dropshield in your helmet if it gets scratched or blemished. Compatible with the Airflite™ helmet.